Both my wife and I generally avoid crowds, prefer quiet and stillness, and need time alone to renew and refuel every day. If charged with the crime of introversion, we would both be easily convicted on multiple counts. We recognize that there may be a few others out there like us that likewise have an aversion to kamikaze shopping on Black Friday. We, therefore, offer the following suggestions. 1. Shop your local grocery store (not the big box grocery stores with toy sections, though). The day after Thanksgiving is often one of the quietest days of the year for a regular grocery store. They’ll be surprised to see you! Buy a Christmas tree at Harmons like we did today and a very nice clerk on cold duty will tie it to the roof of your car and ask you all about your Thanksgiving while he’s at it. Because there’s no one else to talk to. 2. Go to the dollar store. Everything will be the same price that it was the day before Thanksgiving, the same price it is every other day of the year. This sales strategy does not attract a lot of shoppers on Black Friday. Ask them about their door busters (I did today): they’ll look back at you as if you asked them a question in Aka-Bo. Only two cars were in the parking lot this morning. Ours was one of them. 3. Get an oil change and a car wash. We will admit, things were hopping there. One car was in front of ours in the garage bay. And the free car wash that came with the oil change? I think we had to wait five minutes to get on the car conveyor. Yes, there were actually other cars going through the car wash in front of us. Most of them were dirty. 4. Fill up your car with gas at Costco where every day is Black Friday. Same crowds as any day. Four-minute wait, but at $1.89 per gallon, completely worth it. No gas pump rage today. 5. Go to your favorite health and supplement store, Dave’s Health and Nutrition, where they’re having a two-day sale. We did. More sales clerks than shoppers in the store when we got there. I will admit we got there late. Like 5:00 p.m. Everything was 20 percent off. Thinking of going back tomorrow. 6. Fill up your three-gallon water jug at the local artesian well. One other guy there. Pleasant conversation. Room for three people. There less than five minutes. 7. Oh, and shop on the Internet. Big crowd there but you likely will not run into anyone you know. In fact, you won’t run into anyone, unless you have Facebook open on one of your tabs. 8. 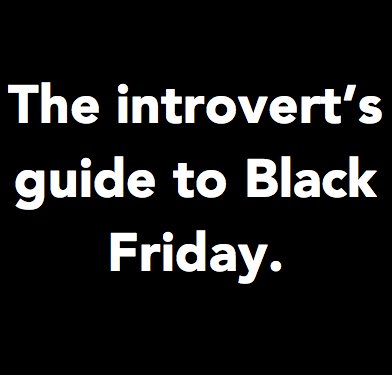 Write a blog post, alone in your study, about being an introvert on Black Friday. It’s okay to maintain a low-pro on Black Friday. Or any other day of the year. It’s not that we don’t like people. We love people. It’s just that we’re not very interesting (or fun) to be around in large, noisy groups, where we run out of emotional fuel, fast. Very good suggestions. I have NEVER gone shopping on Black Friday. I'm just not that kind of a shopper. I waited for Monday after Black Friday, and still did my shopping online. Thanks, Mike. I like your last paragraph–I don't like attending general conference in the Conference Center for the same reasons. Believe me, I understand. 🙂 Thanks for commenting. Yes! I am with you on that.